The Packard Foundation is partnering with Let’s Move! Child Care (LMCC) to award toolkits to support early care and education (ECE) providers in meeting the goals of Let’s Move! Child Care. 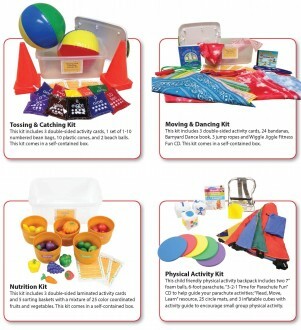 These toolkits include supplies and materials to directly support ECE center/home’s Let’s Move Child Care Action Plan. The toolkits, provided by Kaplan, are valued at over $100/kit and will be a great help in achieving steps on the winning ECE providers’ Action Plans. Develop an Action Plan by September 18th for your chance to win! If you are new to LMCC, you will have to register and take the Checklist Quiz prior to making an Action Plan. If you developed an Action Plan on the LMCC website prior to August 17, 2015, you will need to re-enter the action plan information on the LMCC website between August 17th – September 18th to be entered into the drawing. Centers/homes who develop an LMCC Action Plan online between August 17th – September 18th will be entered into a drawing for a chance to win toolkits. Ten programs will be randomly selected as winners (please note: there can only be one winner chosen per center/home, so program directors, staff, and leadership should complete their Action Plan together as a team). Winners will receive toolkits (appropriate for the number of children they serve) with resources based on their top priority goal area from their Action Plan. The winners will be contacted in the future to see how the materials have helped make positive changes in their center/home.